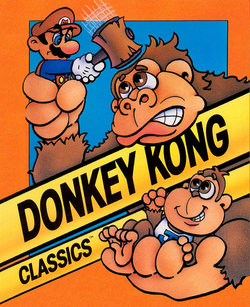 Donkey Kong Classics is a video game collection of the Donkey Kong series, consisting of the games Donkey Kong and Donkey Kong Jr. This compilation is for the Nintendo Entertainment System, which was developed by Nintendo EAD. It was released on October 1988 in the US, three years after the original release of the NES, and August 10, 1989 in Europe. It was never released in Japan. Nothing has changed in gameplay and modes. The only difference is the title screen. It is now a blue color, and the player can switch between the two games and the single and multi-player modes from there. They are exactly the same as the NES versions of the games. For a complete list of media for this subject, see Donkey Kong (game)#Media. 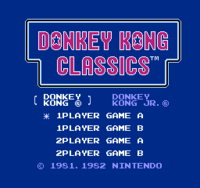 For a complete list of media for this subject, see Donkey Kong Jr. (game)#Media. This page was last edited on January 22, 2019, at 17:01.